A/B and multivariate tests are designed to let marketers know what messaging, content, offers and visual elements contribute to a lift in conversions. In effect, these testing techniques let customers signal what variations in messaging, images and other elements on a website or other digital channel led to a conversion, such as registering with a site or making a purchase. 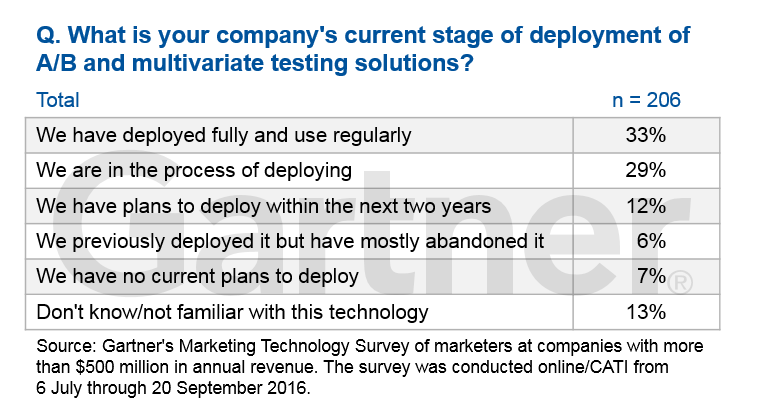 Surprisingly, many marketing organizations have yet to deploy technology to carry out these tests. Gartner’s Marketing Technology Survey of 206 marketers found that only 33% were regularly using A/B or multivariate testing technology and 28% were in the process of deploying a solution. A/B testing or split testing can help to figure out the right way for marketers doing anything for their marketing strategies. Marketing professional can avoid any pitfall by implementing ab testing in their strategy. Thanks Anna for sharing this survey. Keep doing good work.